The first word that comes to mind is...WOW! That was FUN! 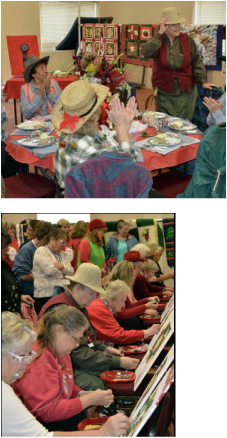 Once again you all came together to make our CVQ Christmas party a huge success. A big shout out goes to those that decorated tables as they are what 'set the stage' for the Christmas party! The way in which the thread theme was incorporated into each table shows just how 'crafty' this group is! Thank you to all those that brought quilts to help 'decorate' the room...they all looked beautiful! We truly appreciate each one who took care of the kitchen set up and clean up for Carol Bingham. Great job ladies! You may have noticed the tall, good looking man with the camera?!? Lorne, Susan Joy's husband, documented our day and you can see his photos by clicking on this link - Christmas Party Photos. Once you open the album, you can click on any picture to enlarge it. To continue viewing them as enlarged, click on the right side of each picture to view the next one. November Program was presented by Diane Knight, a certified Eleanor Burns instructor. Her program included some ‘Eleanor’ tips along with a trunk show. Following the meeting she presented a 10 minute demo. Betty Foley of the TBQ group invited us to her home for a trunk show. There were so many members that wished to attend that we put names into a "lottery" drawing. Winners were in for a real treat at Betty's. Those whose names were not drawn or had been there before went on a CVQ members' studio tour to Susan Gates Harms and Carol Rabbitt's quilt studios. Members met in the church parking lot for a brief meeting and then the two groups were on their way. Everyone met up again at the Bonn Fire restaurant in Chino Valley for lunch and to talk about all they had seen and learned. So much fun; let's do it again! The Yava Button Club were our guests and presented our program. Potato and Salad Bar Luncheon. Our Show 'n Tell followed the luncheon. Please bring quilts and quilted projects that incorporate the use of buttons for Show 'n Tell. Demonstrations via camera and projector! Demonstration of a variety of quilt label styles and various techniques for attaching them. Following the meeting, we demonstrated how-to add a hanging sleeve to your quilt and share ideas for hanging small quilted wall hangings. Following the meeting, we discussed the importance of and demonstrated how-to square up a quilt before you bind it. Demonstrations were via camera and projector! Susan Joy took us from tying a quilt to free-motion quilting, including stitch-in-the-ditch to those intimidating feathers -- and lots of ideas in between. Right after Part 1 was completed, we rolled right into the demo/workshop where we discussed batting options and demonstrated how to sandwich/pin a quilt. We took time to recognize the Friendship Groups within our Guild while enjoying a lovely tea! We thought it would be fun to learn more about all of the Friendship Groups within our Guild…to find out just what they have been up to! In the spirit of friendship…and who doesn’t like a gift…we are asked everyone to bring a pattern or a book that they are through with and played an exchange game. Of course what tea party is complete without finger foods!! Our fingers were busy sampling everything! We honored our early members and those who have guided and helped us to grow into the great organization that we now enjoy. Note ~ if using the Chrome browser to view the PDF file -- Do not print the PDF Tutorial from the Chrome browser. Instead . . . right click on the download link above and save the PDF file to your computer. Next, open the file in Acrobat Reader and then print it using the print options in Acrobat Reader. Due to a computer malfunction, the scheduled program, "Houston International Quilt Festival's Winning Quilts," which was a video presentation of the winning quilts at the 2013 International Quilt Festival was postponed and Plan B was in effect. "Understanding color when choosing fabrics for our quilts"
Maylee brought a selection of her own quilts and a quilt made using the new Lazy Angle Ruler. After our meeting, Maylee demonstrated how to use the new Lazy Angle Ruler by Creative Grids. More programs we have enjoyed . . .